The forties have been an interesting decade for me. I started them with some sort of vendetta, something to prove to myself and to others. After a few years of tearing down my comfort zone and boldly going where I had not gone before, I began to get restless in a different way. I began to feel like none of it mattered. Like everyone else on this planet, I was simply getting older, and no amount of fighting the aging process was going to stop the clock or stop time from marching across my wrinkling, sagging body. Why bother? I mean, we’re all going to die anyway. Who cares if I do it ingesting chia seeds or peanut M&Ms? Most recently, though, as I approach my 46th birthday, I’ve hit upon a new phase. It’s a whole new thing for me, something I’ve not yet experienced. 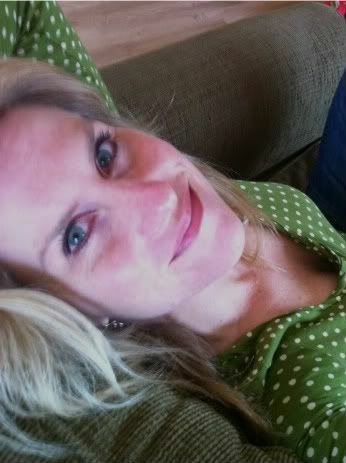 I’m trying to find softness, to forgive myself for what I’m not and to appreciate what I am. After a life of being a perfectionist and being unfairly hard on myself, I’m starting to look the other way on my shortcomings and focus instead on the good. As I begin this new phase of self-discovery, I’ve found that there are people in my life who are determined to derail me. They remind me of what I’m not, rather than celebrating what I am. It’s a constant battle to remain ahead of the naysayers who want to throw sand on my picnic. Last night, I was sharing something Luke did at school with someone. I was particularly proud of this project and was excited to show it off for him. One of his teachers had him draw a self-portrait. Around the self-portrait, he’d written ten statements about himself. All of the statements were positive. I asked him if he’d had a hard time coming up with ten nice things to say about himself. He said he hadn’t. I was so proud of him for having a level of self-worth at 11 that I know I don’t have at 45. The person with whom I shared the artwork had only one statement about it: “Well…he’s cross-eyed.” I looked at the drawing again. It’s true. Luke had drawn one of the eyes toward the center edge, and I guess it does look a bit cross-eyed. I hadn’t noticed that earlier because, well, I was so impressed with the wording around the drawing that I simply hadn’t noticed. Guess my pride in my son clouded my critical, artistic eye. 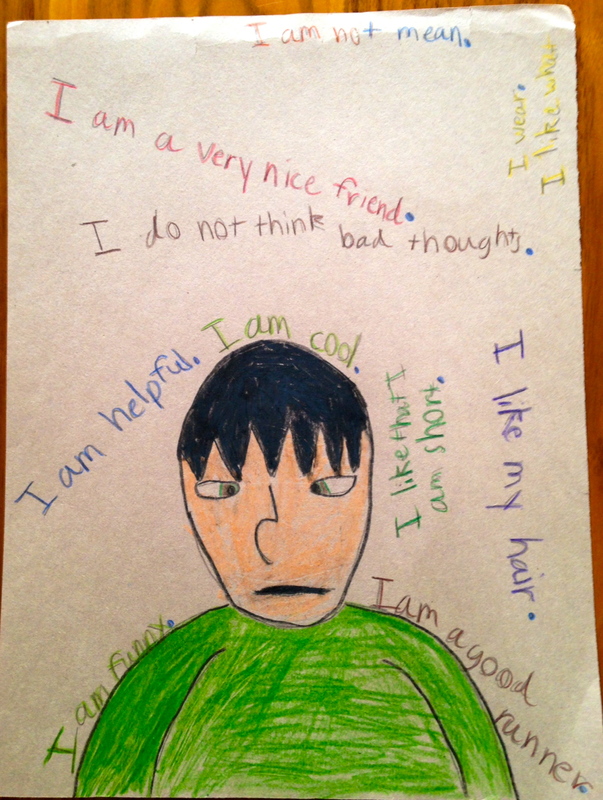 Today, I spent a bit of time reflecting on the negative comment on my son’s sweet piece of artwork. Putting yourself out there like that is a bold move. Letting your mom share it with others is even more bold. If he could be that brave, I could to. I decided to put myself to the test. 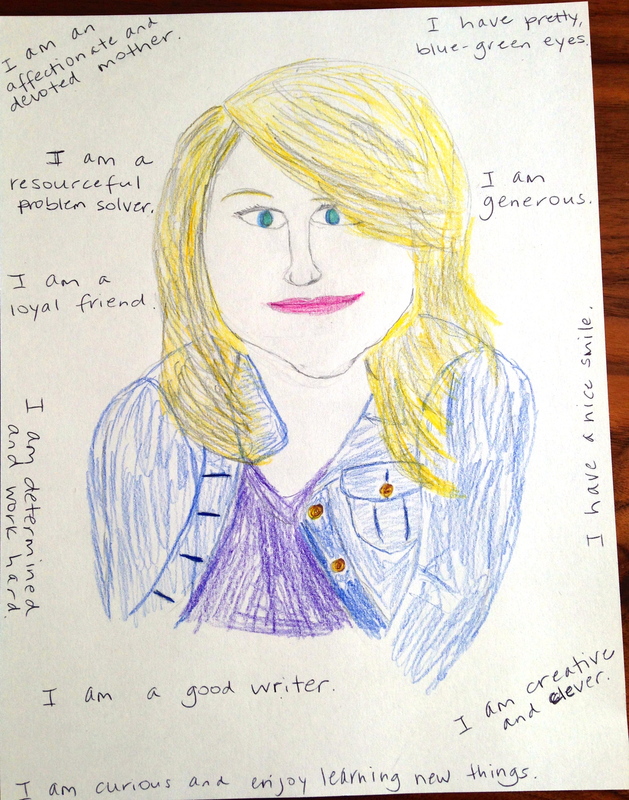 I decided I would draw a self-portrait and see if I could come up with ten positive statements about myself. I wanted to share my page with Luke because he’d allowed me to share his page with others. I also shared it with three other people just to get used to the idea of having confidence in my own self-worth. Tonight, though, I am taking it farther still. I’m going to share my self-portrait with the Internet. I’m no artist, and this activity was difficult for me. As hard as it was to try to sketch myself, harder still it was trying to find complimentary things I was willing to say about myself. It took less time to draw and color my sketch than it took to compose ten positives, and even then I felt very uncomfortable owning everything I’d written. In my head was that little voice spewing self-doubt, saying Who are you kidding? and A lot of folks believe they’re good writers so you’re not special. It was a good exercise for me, though, and one I desperately needed today. It’s not easy for me to find positives because I’ve fairly well breathed a steady stream of negatives through outside voices and disparaging self-talk my entire life. I’m more likely to look in a mirror and find five things wrong than I am to find even one thing right. When Luke got in the car after school, I told him that I’d spent my afternoon drawing and I was hoping he would critique my work when we got home. Luke, being the kind-hearted kid he is, appraised my art and told me that he thought it was pretty good. Considering how much I had struggled with it, I thought pretty good seemed really great. It’s a long road I’m on, this path to self-love and self-acceptance. It has to start somewhere, though, and I’ve decided that somewhere is here and now. Some people will approach everything from a point of cynicism and negativity. I don’t have room for that anymore. I don’t want my children growing up with a mom who has nothing nice to say about herself. I don’t want to be that model for them. The world will beat them up enough. They don’t need to be experts at it too. As for me, I am making changes. You’re entitled to your opinions about me, about how I live my life and how I’m doing it all wrong. You can even share your opinions with me if you want. I’ll hear what you’re saying, but I’m not absorbing it or changing to meet your expectations. I’m happy with the life I’ve built and the person I am continually becoming. I’m not perfect by any stretch. I make mistakes. Point them out if you must, but know that I’m kicking negativity to the curb. If you have nothing positive to say, you can go with it. That is bold and courageous of you. It’s funny how we don’t see ourselves as well as other see us. To me you are always curious, helpful, open minded, attack problems so you are rid of them sooner than later and pragmatic – that’s a compliment 🙂 I admire the fact that you make things happen as I tend to lack seriously in this area. A friend has been reminding me that we are often cruelest to ourselves. We say things in jest that are really hurtful. We have conditioned ourselves to thing negatively about ourselves so we don’t appear boastful or stuck up. Why not celebrate the good in you? 1. Your jacket it awesome! 2. Point me to the piece of work who made the comment about Luke’s drawing…hopefully you can limit exposure to that toxin. Really unbelievable-he/she needs to do some work on themselves. 3. Sharing on your blog is quite courageous and admirable. 4. Keep on keepin’ on, your on am amazing journey! Thanks for all you said here. I truly appreciate it. I can’t change other people’s reactions, but I can work on my own. I am tired of being a negativity sponge. I need to find a better way of deflecting it. Intellectually I know I don’t have to own others’ thoughts, but that is easier said than done. I’m a work in progress. I know I will become healthier with practice.